The interest in showcasing amateur athletes from among all the countries in the Americas led to the creation of the Pan American Games. First held in Buenos Aires in 1948, the games quickly became the venue in which future Olympic champions were given their first taste of international competition. The third edition of the Pan American Games was held in the Chicago, Ill., during the summer of 1959. Eighteen nations participated, but the events were dominated by the U.S., which won a total of 236 medals easily eclipsing runner-up Canada’s 48. 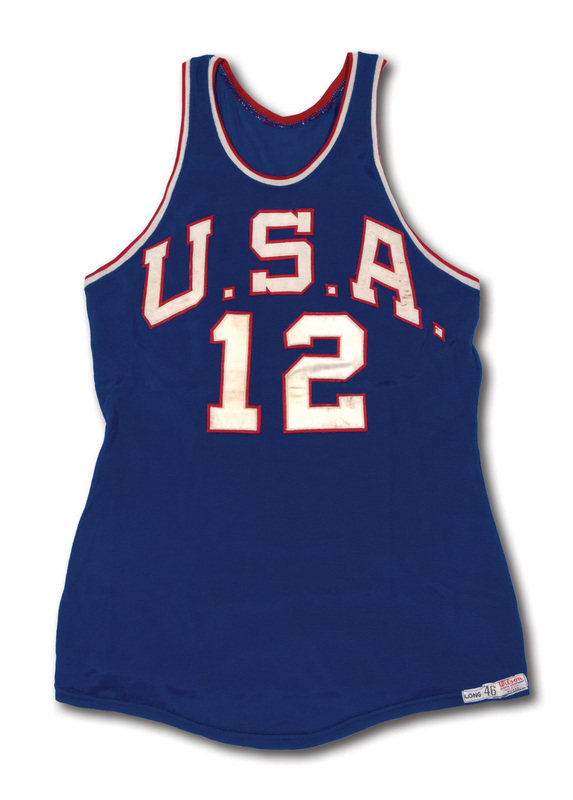 One of the highlights of the ’59 Games was certainly the U.S. Men’s Basketball team. 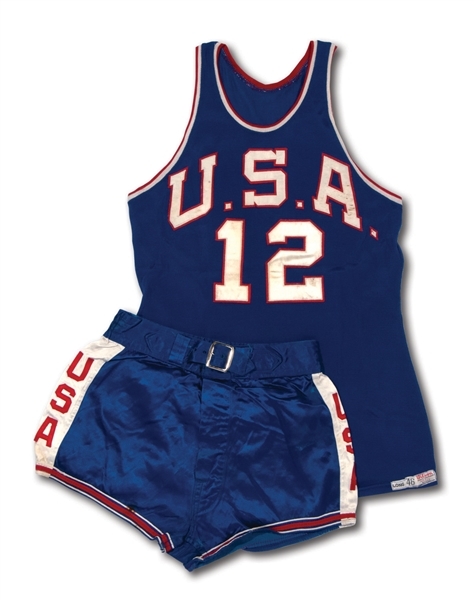 Composed of all the best college players around the country, Team USA featured two future NBA superstars, Oscar Robertson and Jerry West. Robertson led the way, averaging 16.5 points per game as Team USA ran through six nations, beating each one by a 40-point margin on their way to the Gold Medal. Robertson, West and several other Pan-Am Games teammates would form the nucleus of the squad that would take Gold at the 1960 Rome Olympics a year later. 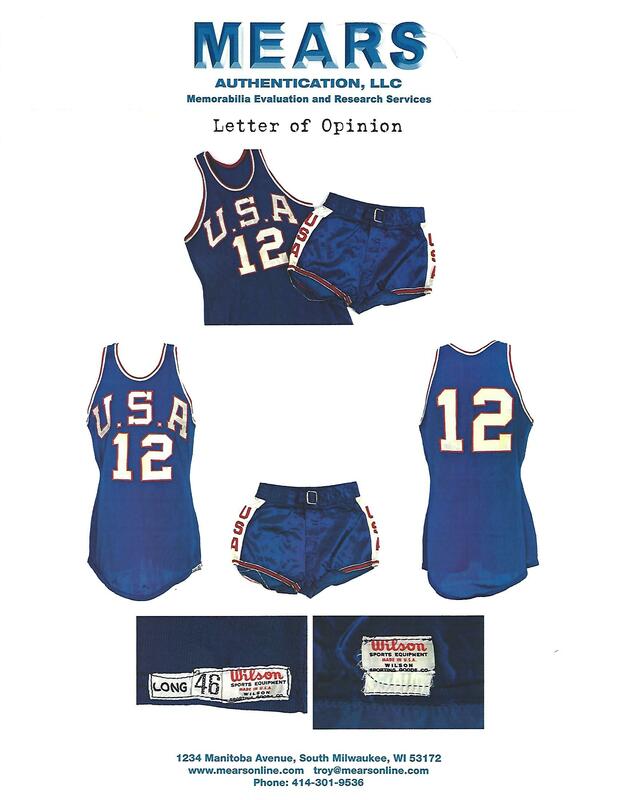 Featured here is Robertson’s complete blue uniform set worn during the ’59 Pan-Am Games. 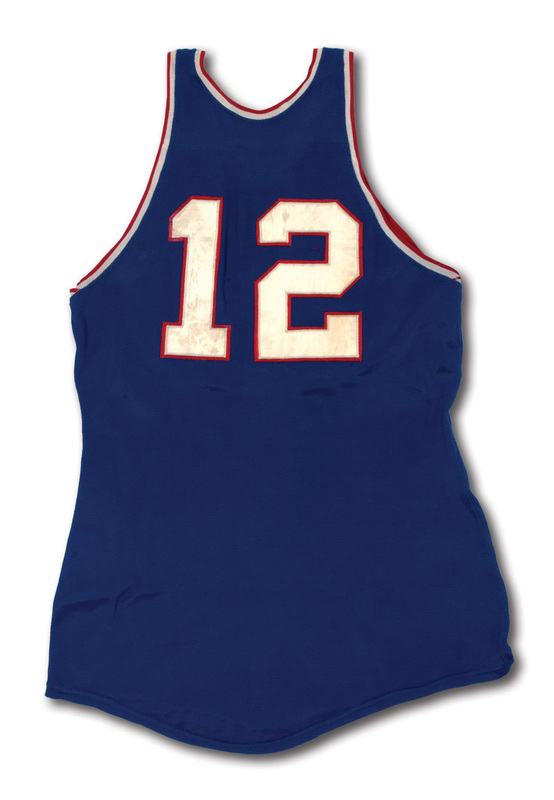 The blue durene jersey, which is essentially the same style worn during the 1960 Olympics, features Robertson’s college number “12” on the front below “U.S.A.” in white and red tackle twill. The arms and neck openings are trimmed in red and white and the back repeats The Big O’s number “12” in red and white tackle twill. 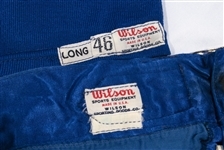 A Wilson label is sewn in the lower left front tail with size “46” and “LONG” strip tags sewn adjacent. The matching satin blue shorts have “USA” in red down both legs as well as red and white trim around each leg opening. The waistband has a silver buckle and integral blue belt that still function perfectly. A Wilson label is sewn inside the waistband with an illegible white strip tag sewn below (appears to say size "34"). Both the jersey and shorts display solid game use with light toning from age along with some loose threads from wear and laundering. 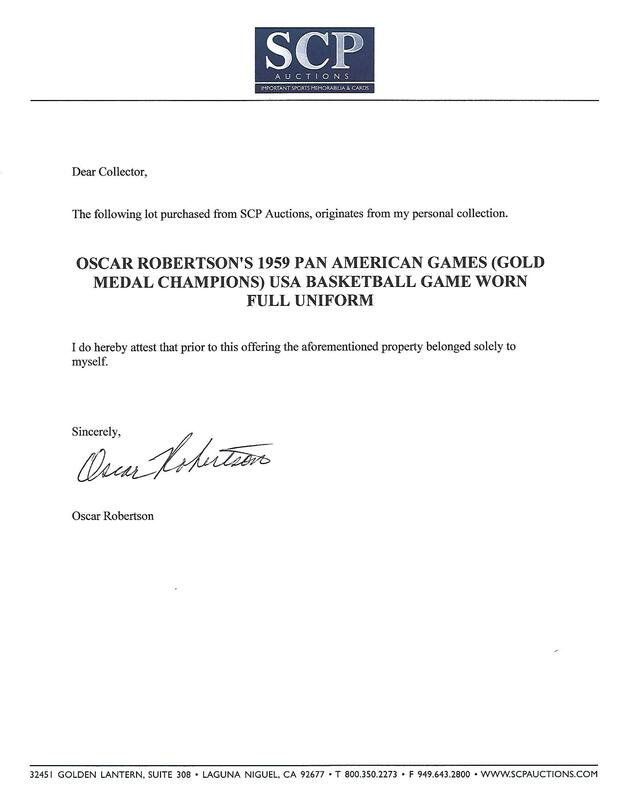 The colors remain bright and crisp, making this a spectacular and complete uniform set from Oscar Robertson’s first foray into international competition. 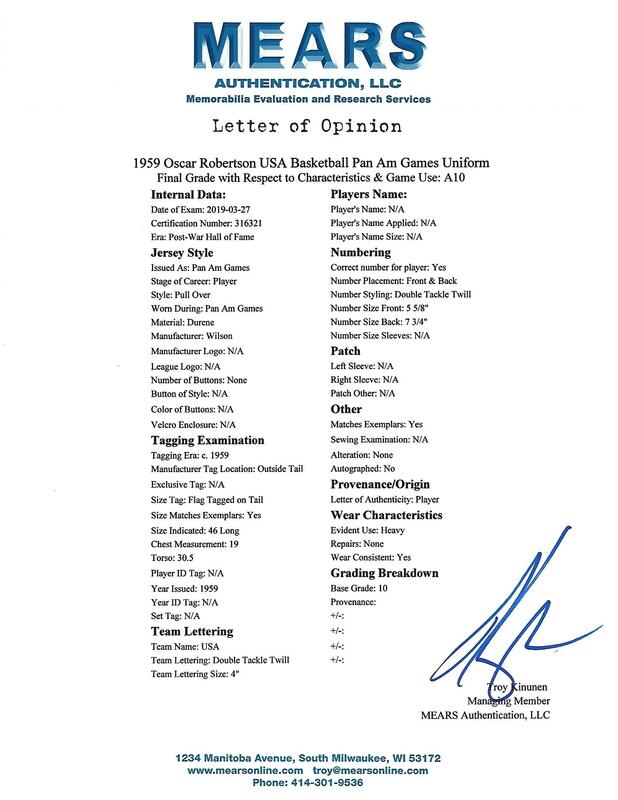 Includes LOA from Oscar Robertson and LOA from MEARS graded a perfect A10.